The Pimcore Email Framework provides an easy way to send/create emails with Pimcore. Pimcore provides a Pimcore\Mail Class which extends the \Swift_Message Class. When you initialize a Pimcore\Mail object, all data from Settings > System > Email Settings are applied automatically. When you enable the debug mode in Settings > System > Debug, all emails will be sent to the addresses given in Settings > System > Email Settings > Debug Email Addresses and the debug information (to whom the email would have been sent) is automatically appended. 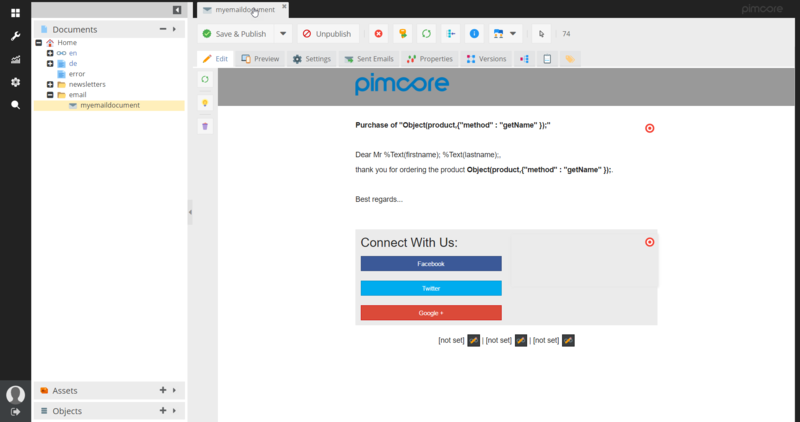 Pimcore provides a Document Email type where you can define the recipients ... (more information here) and Dynamic Placeholders (more information here). To send a email you just create a Email Document in the Pimcore Backend UI, define the subject, recipients, add Dynamic Placeholders... and pass this document to the Pimcore\Mail object. All nasty stuff (creating valid URLs, embedding CSS, compile Less files, rendering the document..) is automatically handled by the Pimcore\Mail object.